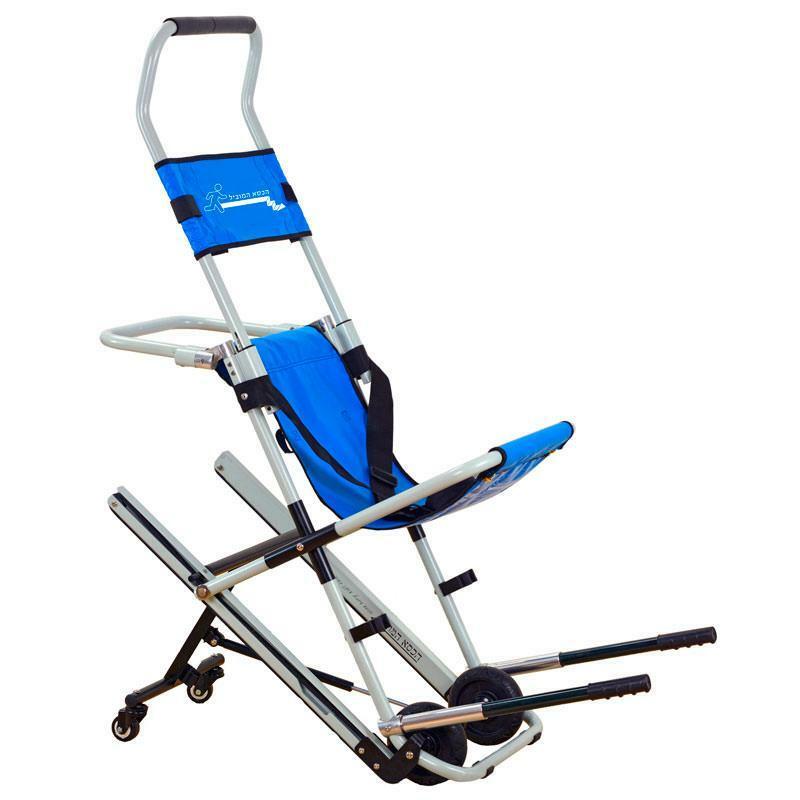 The evacuation and rescue chair is the solution when the elevators stop working; otherwise, people with physical disabilities do not have a way to save their lives. It is clear that people who are wheelchair- bound, people with visual impairments, the elderly, patients and people with other physical limitations will remain stranded on the floor where they are at the moment of danger, while others will rescue themselves running down the stairs out of the burning building. 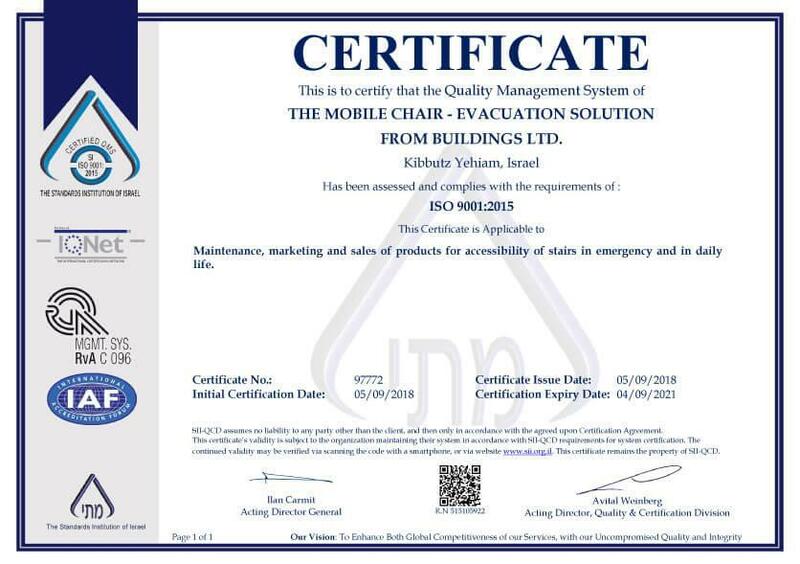 In order to provide a suitable solution to the problem, The Leading Chair Company has developed a cheap, efficient and safe product – a high quality and quick evacuation chair. 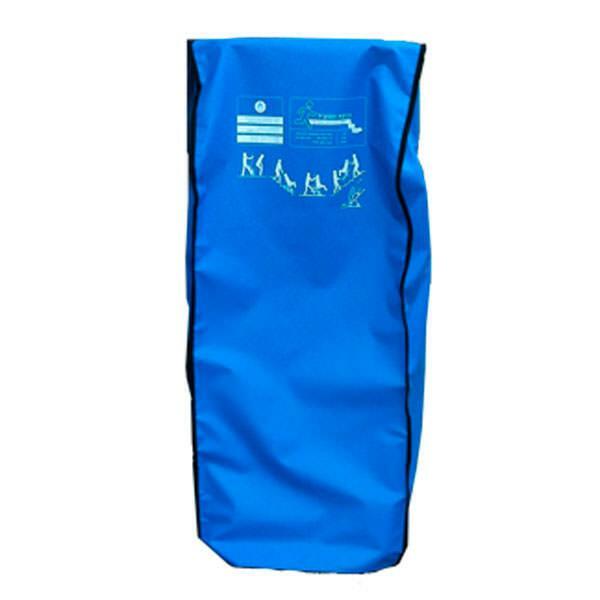 The evacuation and rescue chair is made of oven-painted aluminum and has removable and washable vinyl covers. 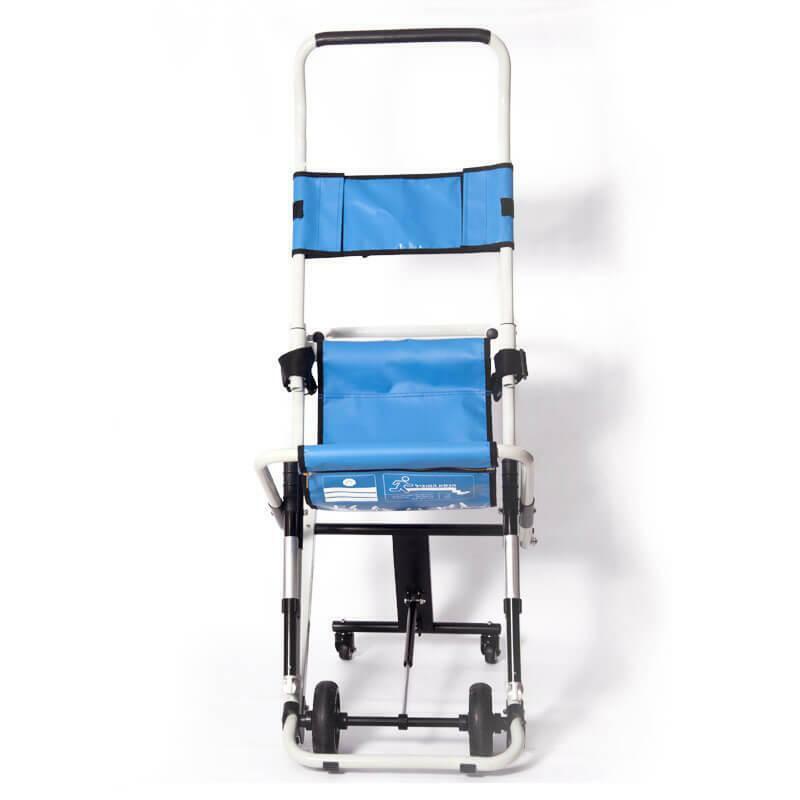 It has rear swivel wheels that enable easy mobility on flat terrain, special tracks for easy descent of stairs, and sturdy handles for manual transport of individuals upstairs. 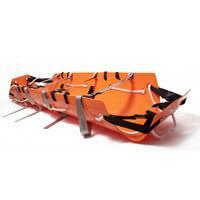 All these built-to-last features ensure a speedy and effective evacuation of incapacitated individuals in emergency and risk situations. 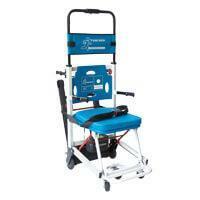 The chair is very easy to operate and allows the operator to control the speed of descent. The chair comes with its own dust cover for ultimate protection when not in use. To save lives, a rescue chair must be installed on every floor of every hotel, office building, residential building, nursing home and hospital. Take the chair down from its wall hook, place it on the floor and hold it so that the piston with attached wheels faces you. Pull the handle upwards until it locks into place. The handle is now secure. 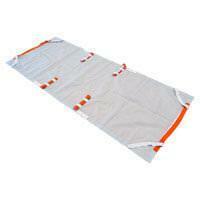 Unfasten the security belts so that the seat chair unfolds. Place the chair behind the person who needs to be evacuated. Hold the chair on both sides and push the upper part forward until the chair is at a 90-degree angle to the floor and the edge of the seat touches the evacuee’s knees. Ask him/her to sit down, and pull the piston frame and wheels backwards with one foot until the piston extends fully. Lower the chair so that all four wheels touch the floor. Adjust the head rest as desired and fasten the head and seat security belts. Make sure the manual transport handles are locked. As you move along the escape route, grasp the side handle with both hands. When you are close to the top of the stairs, push the upper part of the chair forward so that the chair is at a 90-degree angle with the floor. With one foot, push the 2-wheel frame forward until the piston is fully locked. Continue to hold the handle with two hands. When the chair is stable on the first two steps, move your hands to the upper part of the handle while applying slight pressure downwards. Allow the chair to glide down the stairs. Remember: the chair descends on its own power. Do not push it. If you do not feel secure, ask someone to walk ahead and hold the front of the chair. To descend more slowly, tilt your body backward. 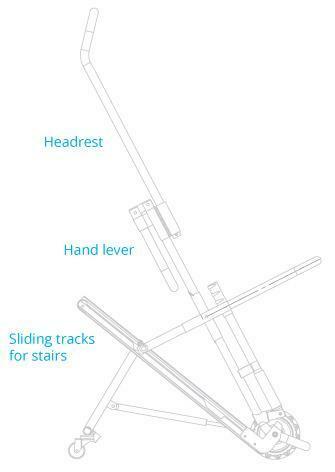 While descending the steps, make sure to keep both hands on the upper part of the handlebar. When reaching the bottom of the stairs, make sure chair is at a 90-degree angle with the floor. Pull the two small wheels out with the help of one foot and bring the transported person to safety. Help the evacuee dismount from the chair by tilting it forward. Make sure to brace yourself so as not to be thrown off balance. 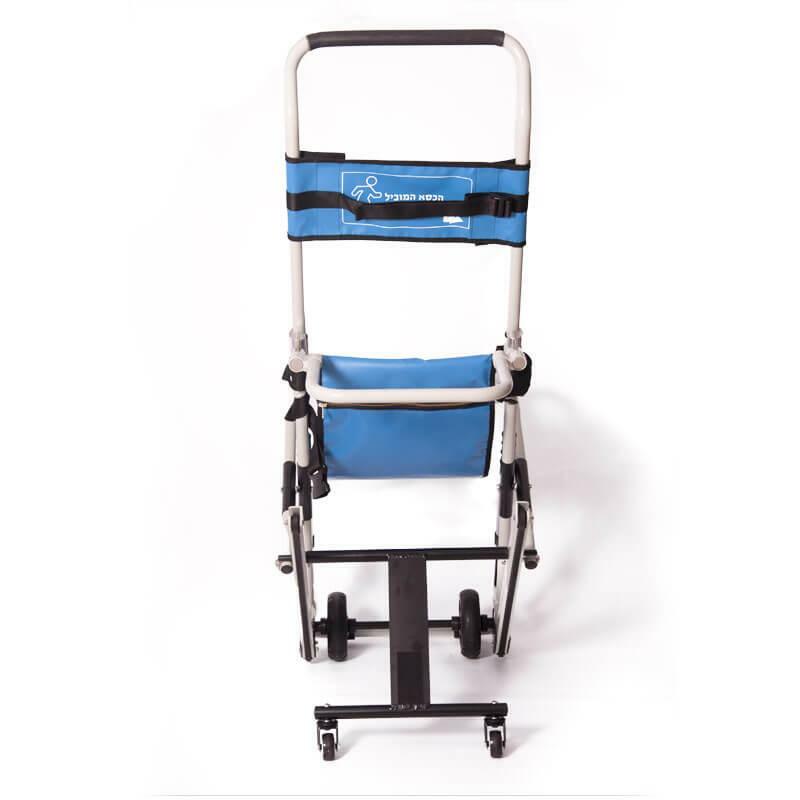 When moving from stairs to a plateau, make sure to stabilize the chair on four wheels. Do not continue to push the chair in a tilted position. Push the two small wheels forward and fold the seat. Release the head rest and close the chair using the safety straps. Return the chair to its wall hook. 1. Extract the bottom handles carefully from their locked position and pull them downward. 2. Push the locking pipe downwards until it covers the connector and locks the handles in place. The chair should not be used without prior instruction by a certified representative of the company. 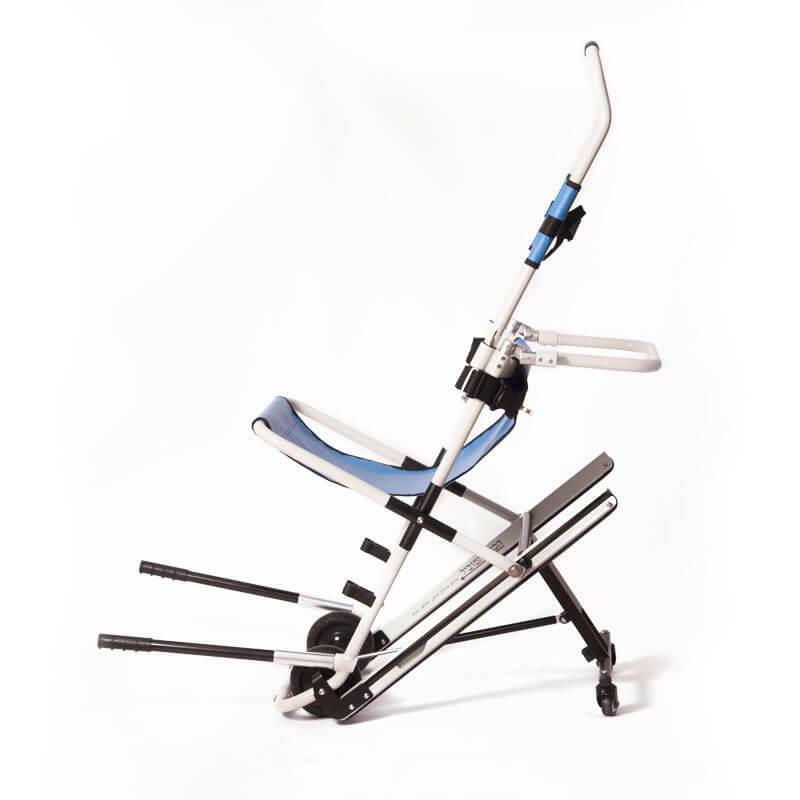 Guided instruction requires two people present: one person holds the upper handle of the chair and the second makes sure that a safe gliding speed is maintained by supporting and holding the lower part of the chair. We recommend annual refresher training sessions implemented by a certified trainer. The chair must be checked annually by a maintenance expert.